WASHINGTON — When some consider the pro-life movement they think about political efforts to overturn Roe v. Wade. But a consortium of women's health care providers is reframing the picture, placing high standards of medical care front and center. Several health care professionals who are presently operating pro-life medical offices from several states gathered before approximately 100 people at Busboys and Poets coffee shop in Brookland near The Catholic University of America last week just prior to the March for Life to launch the Pro Women's Healthcare Centers. "PWHC is transforming the cultural landscape for women's health care in an era where women are looking for more choices," said Chaney Mullins, operations manager for PWHC, in an interview with The Christian Post. 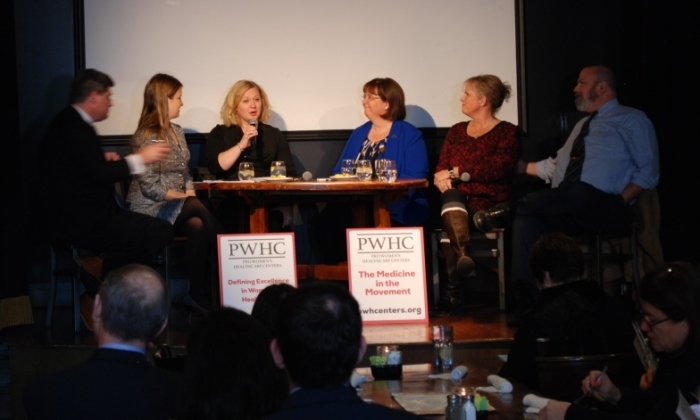 The mission of PWHC is to partner with women in providing high-quality medical services and access to social services that empower them to care for their health, a panel of five pro-life medical caregivers from Colorado, Minnesota, Arizona, and Virginia, explained. Crisis pregnancy centers around country can become certified members of this consortium once they expand to meet PWHC medical service requirements and implement the high standards for life-affirming care outlined in the official guidelines. The gathering, which was sponsored by the Fairfax, Virginia-based Divine Mercy Care, took place to unify medical workers and supporters of the pro-life movement around the shared goals on the clinical side of saving unborn children. Attendees were given a four-page booklet outlining precisely what is required and what is encouraged in order to qualify to receive PWHC certification. PHWC certified affiliates must provide medical services that are comprehensive, convenient, compassionate, and high-quality. The over-arching goal is to provide women who do not want an abortion with excellent health care beyond prayers, sonograms, and material assitance. Dr. John T. Bruchalski, who founded Divine Mercy Care and runs the Tepeyac OBGYN in Fairfax, Virginia, stressed in a panel discussion that it is about time that Christians and like-minded pro-lifers started doing health care in a new way, and frame the conversation about medical services in a more holistic manner, particularly since the health care system in the United States is in dire need of solutions. "Abortion is considered good medicine today. The health care system has adopted abortion as a good item," Bruchalski told CP in an interview. And while there are patients and medical providers that absolutely disagree with that, "the missing piece has been doctors standing up and saying 'We want to help women with real comprehensive and building of health care." The consortium aims to revolutionize the way people both think about and access medical services by providing a more personalized, organic, life-affirming, and distinctly relational approach to health care and reproductive needs. The requirements to be PWHC-certified that fall under the medical services category include offering basic preventative health services, having STD testing and cervical cancer screenings on site, offering clinical breast exams, conducting mammograms or being able to provide a nearby direct referral, and doing post-partum depression screenings, among other things. Many existing organizations and crisis pregnancy centers nationwide want to "medicalize," Mullins explained, and the standards set forth in their documents now provide language for what that means and shows examples of centers that have already done it. "It is truly the medicine in the [pro-life] movement," she said, adding that each PHWC certified center "brings women prenatal care, childbirth, and post-partum health care, meeting the immediate needs after a woman makes the choice to have her baby." The way women are treated as patients, the way doctors handle fertility and infertility, how miscarriages are addressed, how adolescents receive health care education, are all part of what it means to be life-affirming and pro-women in every way, Mullins continued. "We want to not use destructive procedures to promote health, but in fact, we want to meet you where you are and give [women] options." Bruchalski used to perform abortion procedures before having three powerful encounters with the Holy Spirit and stopped doing them. He also ceased prescribing contraceptives and told his hospital colleagues he would not do artificial reproduction. By the end of his residency, "many of his fellow residents had followed his lead and ceased performing abortions," his website testimonial notes. "If you can show women that they can get through the difficult time, whether she's with insurance or without insurance and then that doctor's practice or that health care facility practitioner then they partner with all these incredibly wonderful pregnancy centers and social services and even those on the other side [of the abortion debate], we will show you how to do a perinatal hospice so they don't have to end the life of a child," Bruchalski said. "We can actually make children welcomed, women healthier, families stronger by just providing excellent health care." "For too long we have allowed [the idea of] planned parenthood, for lack of a better term, to run the narrative. And now you have many people who are pro-choice but they want a better way of spacing kids. They want to be listened to as women and they want to be empowered." Agreed upon medical standards provide a "launching pad" to do that, he said. "If we can use charity, competence, and excellence with standards, then the 50 to 80 percent of women who intrinsically do not want abortion on demand, they can trust these people across the country rather than ending up in a tight spot or a difficult medical situation and then not knowing what your doctor would do."